Just 25 minutes from the Torres del Paine National Park entrance, Tierra Patagonia Adventure and Spa Hotel sits comfortably on the shores of Lake Sarmiento. Surrounded on all sides by rolling pampa blanketed in evergreen shrubs, the hotel looks directly on to the waters of Lake Sarmiento with the Paine Massif filling the horizon above it. From Santiago de Chile, take a flight to either the airport in Puerto Natales or Punta Arenas, noting that Puerto Natales is only open during the Chilean summer months. LATAM Airlines, Jetsmart and Sky Airline operate several daily flights to Punta Arenas, taking around 4 hours from Santiago. You can also charter a private plane between Santiago, Punta Arenas and Puerto Natales. 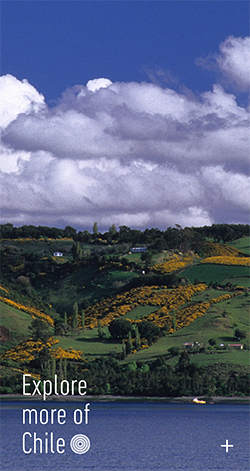 From Punta Arenas Airport, it is a drive of around 4 or 4.5 hours to Tierra Patagonia. We provide a regular transfer shared with other guests, on a daily basis, which is included in our all-inclusive packages, starting at three nights. Additionally, we offer transfers from the pier in Punta Arenas for anyone taking a cruise, from the border crossing with Argentina at Cerro Castillo. We also provide a regular shuttle to/from El Calafate in Argentina, included on a minimum four-night stay with our all-inclusive programs. * Please note: All transfers have specific pick-up and drop-off times. Contact our Reservations team for more information. If driving yourself to the hotel from Punta Arenas, take Route 9 northbound, travelling roughly 250km to Puerto Natales. On arrival in Puerto Natales, continue on Route 9 North, heading towards Cerro Castillo, roughly 55km away. 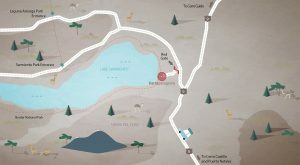 At Cerro Castillo, continue northbound, taking all roundabout exits which point towards Torres del Paine until the road gradually turns from asphalt to gravel for 31km, where you will arrive at a distinct crossroads. A large red and white building will appear just before it, you’ll notice a shed-like bus shelter and sign indicating ‘Cerro Guido 17km’. Take a left at this crossroads, heading in the direction of the national park entrances of Portería Sarmiento and Laguna Amarga. After 4km, a red gate with black posts and sign for Tierra Patagonia will be on your left, enter and continue on for 800m until reaching the hotel!